The history of Fiber Arts must begin with the basics: fiber. Fiber has plant, animal or synthetic origins, and whether it is real or synthetic, rigid or flexible, fiber resists abrasion and breakage while soaking up moisture without dissolving.These characteristics provide an endless world of creative opportunities for the imaginative. Fiber Art is more than just aesthetic enjoyment — it also exists to make utilitarian objects, such as clothing and "wearable art." 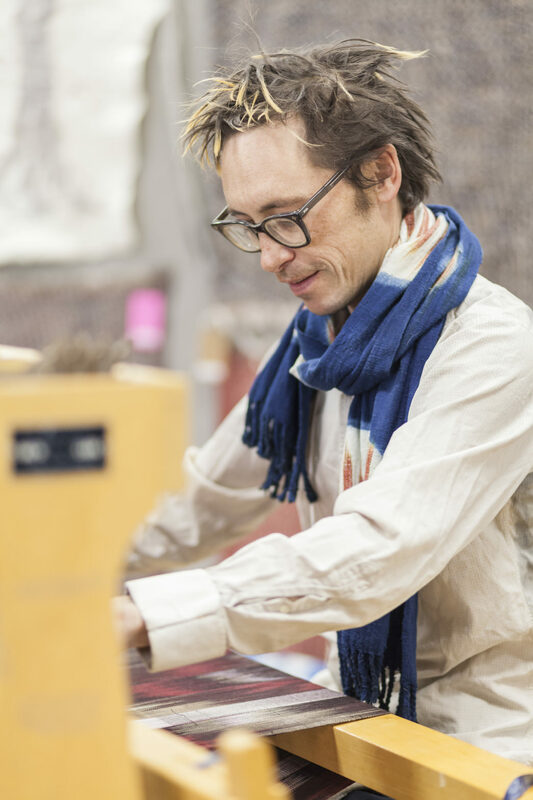 In addition, contemporary Fiber Art is a creative outlet for cultural expression that can take many forms: an embellished T-shirt, a handwoven necktie, or an enveloping shawl. In the thousands of years between the end of the Ice Age and the coming of Spanish explorers in the 15th century CE, flexible fiber in New Mexico came in the form of human hair and fur from domesticated dogs while more rigid fiber was harvested from wild plants. If you look closely, the sandals, baskets, robes, mats, snares, cordage, and almost everything else people needed are as beautifully made as they are utilitarian. Techniques include finger weaving, sewing, braiding, plaiting, spinning of thread, cordage and yarn using a variety of tools, myriad forms of looping, knotting, and weaving on the backstrap loom. Plant dyes yielded browns and yellows while minerals provided reds, yellows, and black. By the 13th century, cotton was being grown in northern New Mexico, having further adapted to shorter growing seasons, higher elevations, low nighttime temperatures, and variable rainfall and soil quality. Weaving this new fiber prompted new technology: the portable, vertical Pueblo loom, recognized by most observers as the loom Navajo weavers use to make their famous blankets today. Ancient New Mexican culture and daily life changed dramatically in 1598 with the arrival of Juan de Oñate, who brought from Mexico hundreds of settlers, soldiers, priests, and servants, and thousands of animals, including the sturdy Churro sheep up the Camino Real de Tierra Adentro. Churro sheep are highly adaptable to a range of environmental conditions and served the colonists well, primarily with wool. 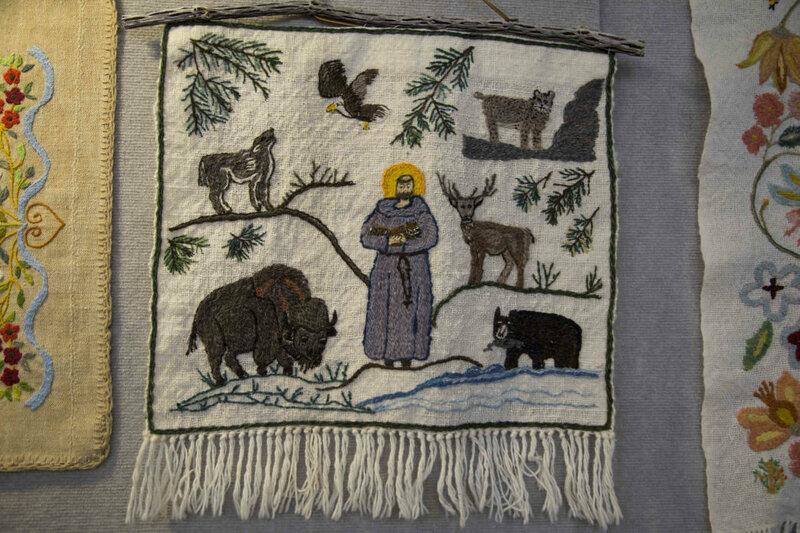 The fleece is characterized by a long, coarse outer coat covering a shorter, softer inner wool that requires little water to clean, spins easily with a variety of techniques, and takes natural dyes well. Older textiles woven from Churro wool are soft and shiny. 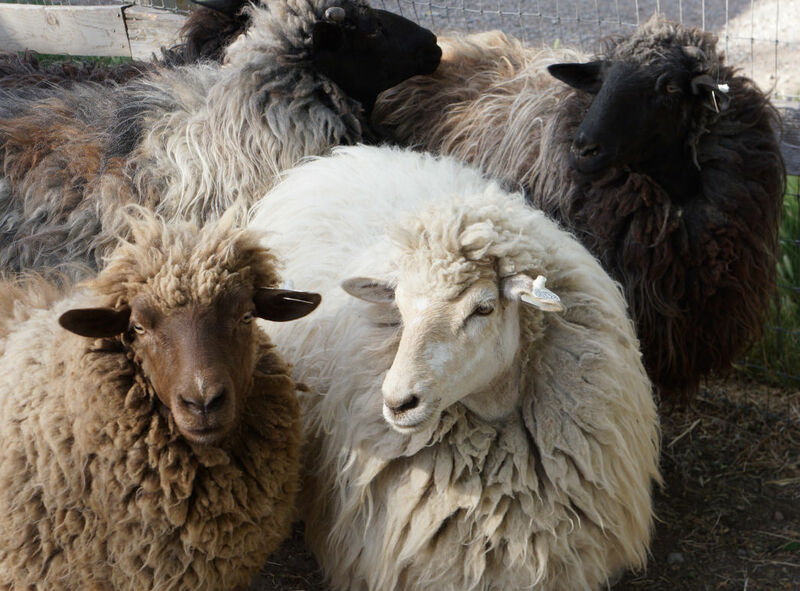 For nearly 300 years, until the coming of traders over the Santa Fe Trail in the 19th century, Churro sheep wool was the foundation of many Native, Spanish, and Mexican textiles. Spanish colonists also brought the horizontal European treadle or floor loom. Handspun cotton yarn could not be woven on the treadle loom as easily as handspun wool yarn could. The time spent handspinning and weaving wool in workshops established by the Spanish for Native weavers, along with the time required for their religious instruction, took precedence over tending to cotton and other Native crops. Eventually, cotton weaving on the vertical loom largely ceased among Native people by the end of the 19th century, although weaving with wool on those looms continued. In 1638, Spanish businessmen established a textile workshop in Santa Fe using both Spanish and Native labor to produce woven goods for export to Mexico City using handspun wool yarns. Just about 5 generations after Spanish colonists first arrived in northern New Mexico, Native people killed or expelled the Spanish from the state during the Pueblo Revolt of 1680. For 12 years, pre-Conquest Native lives resumed, while Spanish culture was conscientiously eradicated. Written records were also destroyed in the Revolt and details of newly hopeful Native lives are scarce; for instance, it is not known if farming and weaving of cotton on the vertical loom was resumed. In 1694, the Spanish Reconquest reestablished the Colonial textile-labor system, including enforced Native labor under returning Spanish landowners, but Native weavers were allowed to produce more for their own use as well. By 1790, Albuquerque reported some 90 weavers in the area due to its proximity to large sheep herds in southern New Mexico. Poor quality of New Mexico weaving exports to Mexico led to the sending of master weaver brothers Ignacio Ricardo and Juan Bazán to Santa Fe from Mexico to teach the art of weaving to approved apprentices in 1807. More than 20,000 Rio Grande blankets, sarapes, and rugs were shipped to Mexican markets in 1840. Rio Grande design elements woven today as blankets and sarapes in northern New Mexico continue the legacy of the Bazán brothers. In 1821, Mexico gained independence from Spain. In 1825, the new government legalized international trade with the United States along the Santa Fe Trail. By 1843, the majority of trade along the trail was dominated by traders from New Mexico and Chihuahua headed east to the United States. The new trade brought new materials and finished goods, including cotton cloth, from American textile mills in return. In 1879, the arrival of the railroad brought machine-woven cloth, commercially produced yarn and synthetic dyes. 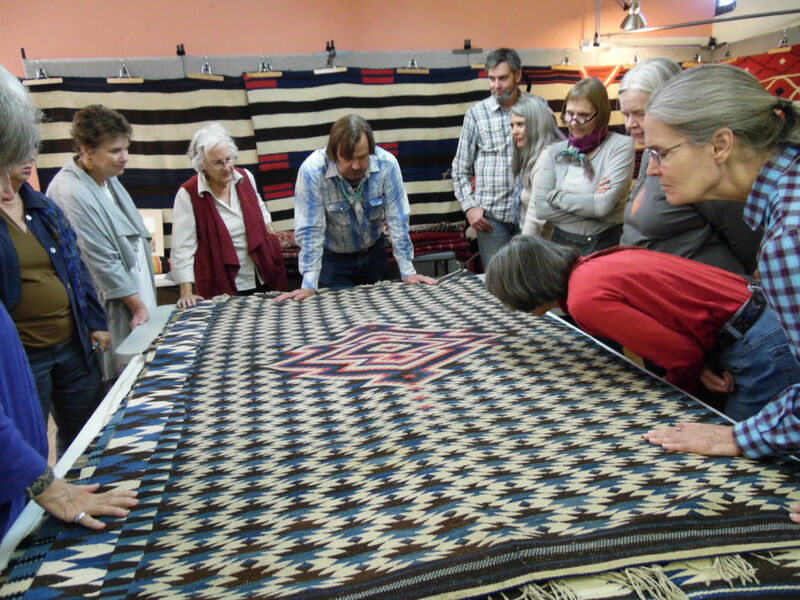 The demand for Navajo handwoven blankets or rugs with a Southwest look increased, as tourists became more frequent. Trading posts were established so Navajo weavers could trade handwoven rugs for other goods. Only small Spanish communities in the Española area, such as Chimayó, continue the Rio Grande weaving tradition today. Pueblo weavings have declined and are mostly made for ceremonial purposes now. During the early 20th century, women in communities surrounding Taos took an interest in reviving Colcha embroidery, forming a Colcha Club that for decades involved the last elderly practitioners of an art form limited to northern New Mexico and Southern Colorado. In the mid-1970s, as part of a national "craft of the handmade" revival that continues unabated, New Mexico locals and outsiders alike felt a strong desire to preserve other handcrafts in New Mexico, starting with the art of weaving. Cooperatives and art museums were formed, which set out to not only honor weaving traditions of the region but also to help self-supporting textile enterprises develop economic opportunities. Today, 6th and 7th generation weavers in Chimayó continue the long tradition of Rio Grande-style weaving, all done on a two-harness "walking loom" — so-called because two treadles are operated by standing on one or the other in turn — and the intricate designs of saltillos, stars, and mesa-like designs are woven in the tapestry of the fine wool. Numerous galleries now carry historic and contemporary Navajo rugs and multi-generations of artists are keeping this tradition alive. 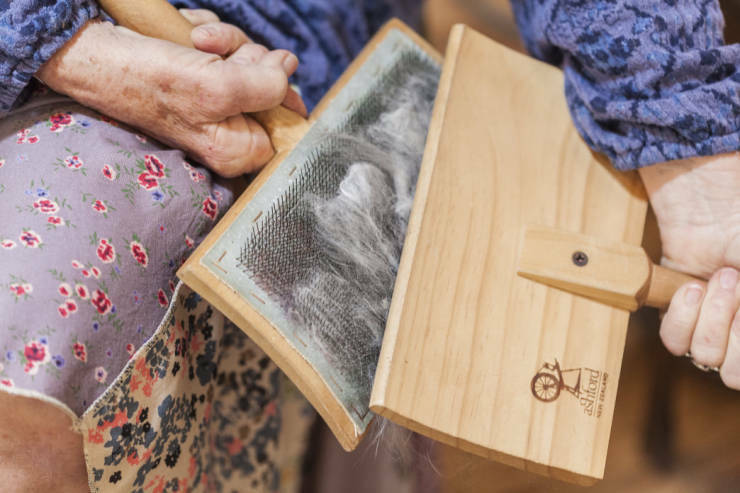 Thanks to cooperatives, guilds, and fiber arts centers, including the Española Valley Fiber Arts Center, weaving, handspinning, natural dyeing, Colcha embroidery, felting, knitting and other needle arts have expanded beyond a traditional practice of creativity and/or utilitarianism. It’s now a source of income for those who live in isolated areas where work is scarce and distribution would otherwise be too difficult. 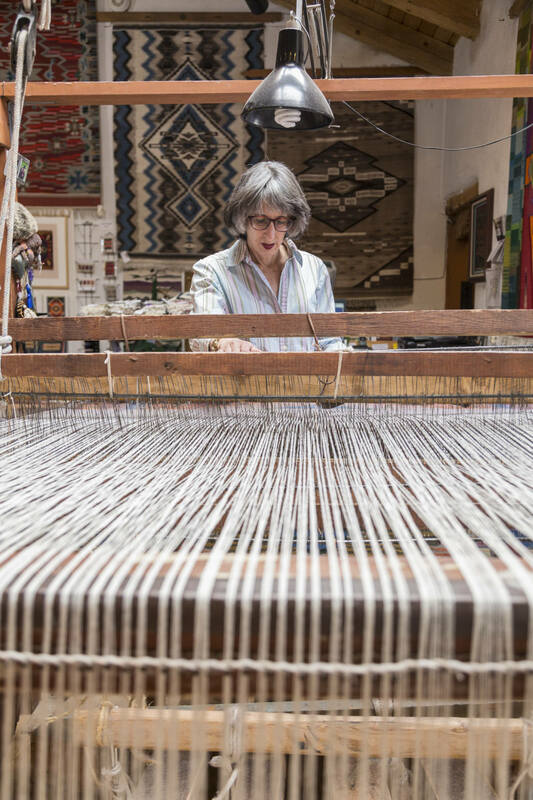 Honor and support the rich Fiber Art tradition of New Mexico by making fiber arts part of your next visit to New Mexico with a visit to a museum or an artist’s studio or by taking a class. Written by RootsRated for RootsRated in partnership with New Mexico.